I bet you’ve never looked that closely at a snowman’s bottom! 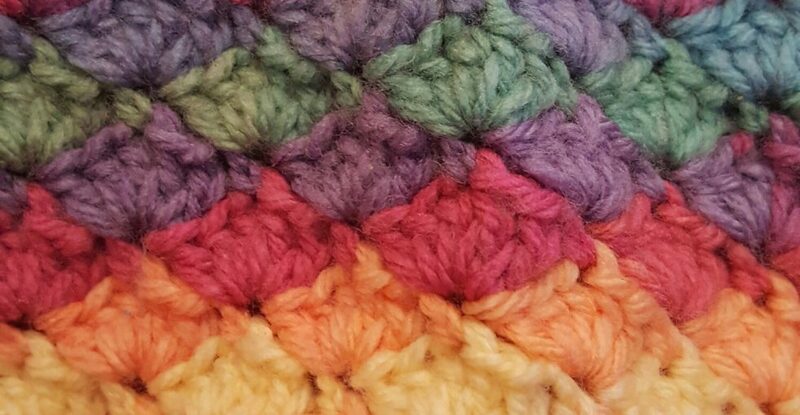 Whilst the children have been at school, I’ve had a chance to crochet a lot more (so much so that I’ve actually hurt my wrist and am now on a short rest break from it!) Anyway, I normally crochet whilst watching TV in the evenings, so daytime crochet is a bit of a new own for me. Daytime TV is, if I’m honest, absolutely rubbish, but I can’t sit in silence as I just don’t like it. I had heard various crafters talk about podcasts, but, not being an iPhone owner, they were not something I had used. Also, because of my penchant for watching soaps once the children are in bed, I hadn’t considered podcasts as an option because I might have missed an exciting storyline. However, they suddenly seemed a great idea to fill the daytime silence. A quick poll on a Facebook group I’m in gave me a rather long list to try. The first one I listened to was Knit British, and it was quite relaxing and a nice change from TV. I have also listened to Crafternoon Treats and Cherry Heart, all of which have been enjoyable too. It doesn’t end here though, because they have started a revolution. I don’t just have to craft whilst listening, I can do other tasks, like the soul destroying folding up of washing and the ironing! Oh yes, those chores are no longer hours of doom and gloom in my week, the wonderful podcasters take the edge off the pain, rather like co codamol. I wouldn’t say the jobs are enjoyable, but they are more tolerable. (And I’m sure many mums would agree, an excuse to disappear upstairs for an hour away from the weekend chaos is almost a treat.) There’s no photo for this because I didn’t really think you’d want to see my ‘little bit frowny because I’d rather be crafting than doing this’ face and the ironing board so you’ll just have to imagine. If you have any podcast recommendations, please let me know in the comments! I’ve also started up my little business selling a few items here and there, and I’ve been lucky in getting a few orders already. It’s the time of year when Christmas craft fairs are being advertised a lot and I’d kind of brushed off the idea of going to one as a maker. (What if I didn’t have time to make things? What if I had no ideas for things to make? What if no one wanted to buy my creations? and so on.) Then I saw an advertisement for one in our village, with only a single table remaining. My inner spontaneous side (not seen very frequently) took over and immediately asked if I could have it. Then I got a reply and it had already been taken, but they were going to shuffle things around and squeeze me in. So, there we have it, I’m doing my very first Christmas craft fair! I might have to whip up a lot of these chaps for the craft fair! I think I’ll have to stop saying ‘never’, I’m going to land myself in all sorts of situations if I’m not careful. For all of that, though, I’m glad I’ve discovered some new things. Have you ever done anything you thought you’d never do? Thanks for sharing about the podcasts. I’ve been thinking of tuning in to something like that as well. Congrats on getting into the craft fair! And those snow people are adorable! They’re fab, I’m so glad I listened to one. Thank you, hope I can sell something! I know exactly how you felt… My first attempts on a magic loop failed so hard, that I almost considered quitting. But the best tip for anyone trying the magicloop for the first time is not to give up!! I hope I do also. Etsy nice but its a slower process. I think a crafty fair would be fun and exciting. People will love your crochet items and I have seen some of your cards.. very pretty. I can not wait to hear about it! Thanks, luckily I have just over 2 months to make things! I haven’t ventured into etsy yet as Facebook has provided me with enough orders to keep busy so far. ohhhhh =) I havent tried to sell on facebook yet.. I have a business facebook though I havent used it as the selling platform yet.. Mostly I sell through Etsy. It’s quite easy on Facebook but most of my customers are other school mums so delivery and payment is easy at the school gates! Its always good to try new things, though not always easy. Well done! Thank you, some things are definitely trickier than others! I sure love those snow people! They are adorable! I found that too, but I could not do the magic ring without a loopy bit on the first stitch. I’ve got it now though! An ideas book sounds fab, I have an ideas area at the back of my blog notebook. Ok… I’ve always got that dazed, rabbit in the headlights look on my face when anyone has mentioned podcasts to me, as I have NO IDEA WHAT A PODCAST IS! Yes, seriously. It was like someone was talking a totally different language. So … even though I’m not a fully paid up knitter or crochet expert, I clicked on one of your links so that I could see what a podcast actually was. It’s a bit of film! We would have done this on one of those movie cameras…. back when dirt was invented. Or … have I got it wrong? I watched the whole hour of a lovely lady teaching me things I never thought I’d know, and telling me that she died her own wool – and wanted to die some wool using beetroot. However … she confided in me that beetroot doesn’t die things red. Ohhh no siree! When you use beetroot to die things … anythings …. it dies things …. YELLOW!!! Surely this has to be a bit of witchery? Hedgewitchery? Harry Potter Magic Spellery? What? She must surely have a broom and wand!!! I can’t find a link to your Etsy shop. Is there one on your blog – in your sidebar perhaps …. and me being me, I’m totally ignorant of it or completely blind? I know I need to go and get my eyes tested for new reading glasses … but I cannot find a link. So glad you tried a podcast, they are rather good. Some are just audio too, which is fab for when you’re crafting. I’m not sure about the beetroot colouring thing, but I am all for natural dyeing. I’m afraid I don’t have an Etsy shop, I’ve just not set it up! I will, eventually and then I promise I will leave a link. Natural dyeying is fantastic. I’ve only fairly recently heard about how this is used to dye wool, and it blows my mind that it can be done at home. It seems like a ‘big job’ – so I’m just in love with the idea that regular folks can do it themselves. Ohhhhh… ewwwwwww!! Or should that be EWE. lol. I don’t know the smell … but somehow my brain can imagine it, and boy does it smell ugly! I vote for Mr.C … I wouldn’t want the house smelling like that either. ewe. By the sound of it, if you do it in the garden, not only will all the flowers wilt, but the neighbours will complain about the stink too! [groans] …. and here I am moaning when the wind is in the wrong direction and the farmer has fertilised his fields!! WHEW! I don’t listen to any crafting podcasts, but I do enjoy Welcome to Night Vale, which is a twice-monthly ‘radio program’ with lots of weird things in it. That sounds interesting! I only listen to the radio in the car normally. Thank you, they really are magic now I can do them! I need to master the magic ring too! It’s on my to-do list. Good luck with the fair. I’ve done a few with varying degrees of success (or otherwise)! It can be very deflating if there aren’t any visitors. I am sure you’ll be fine though and those snowmen are irresistible so you will likely sell loads! Can’t wait to hear how it went. I just got hired to teach an art class for 5-8 year olds! I NEVER thought I’d teach art! Good for you for doing the craft fair, those little snowmen will definitely sell (they are so cute!). As far as podcasts go, I listen to Craftish with Vickie Howell, A Yarn Thing with Marly Bird and Create and Thrive. All good for trying a business in the craft industry! 🙂 And I am sure you will too 🙂 You have huge amounts of knowledge to pass along.. Thank you, I’m hoping to get started soon!